Yucca elephantipes (syn.Yucca gigantea) is one of the most widely grown of all of the Yuccas . Traditionally used as an outdoor plant, and often grown in containers, it is also widely grown as an indoor plant, and as it is suited to filtered light and also grows well in containers it is very useful for indoor landscaping projects. Also known as the ‘spineless yucca’ it does not carry the same sharp foliage as some other species, another good feature for an indoor plant. This is a tall growing species that can reach 10m plus over time. 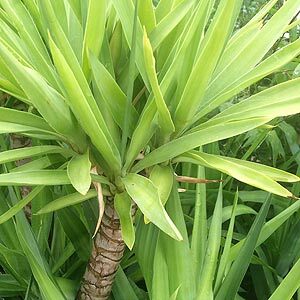 Also known as the ‘Soft Tipped Yucca’ this large growing species needs to be planted where it has the room to grow to its full potential. It is usual to see thee plants of different height grown in the one container, this give height, as well as providing foliage lower down. Native to Mexico and surrounding areas this is a spineless Yucca and also the tallest growing of all of the Yuccas. Excellent in coastal areas, and a standout plant in a Mediterranean style garden. This is a flowering plant, however in low light situations it tends not to produce flowers. Available from wholesalers in a number of sizes from less than 1m to advanced plants. Yucca elephantipes is also available from plant hire companies. Growing well both outdoors and indoors however when grown inside it does require good light. We suggest good filtered light from a window facing the sun. Less light will slow the growth rate and this is an advantage as the stems do not grow as quickly. Easy care as it requires little water and thrives in the low humidity of areas such as offices and shopping centers. Watering should be regular indoors, always allowing the soil to dry a little between watering. Ensure that the pot is draining well as Yuccas do not like to have their root systems continually wet. Indoors a little added humidity may be needed if heating ducts and air conditioning are close to the plant. A liquid fertiliser every two months will be adequate in most positions. When grown in containers it is advisable to repot Yucca elephantipes every 3 years. When repotting you can remove any offsets to propagate new plants and tidy up the look of the container. Plant will easily reach 2m in height and with a growth rate that varies according to the amount of light it is slower indoors than outdoors. You can reduce the height simply by cutting the head of the plant off, you can do this almost anywhere on the stem. In time the plant will reshoot from where it was cut. This method produces multiple heads on the plant. At the same time the head and stem that you have removed can be potted and will usually strike well, producing roots in a matter of 3 – 4 weeks. You will need to provide some support until the root system develops enough to support the plant.